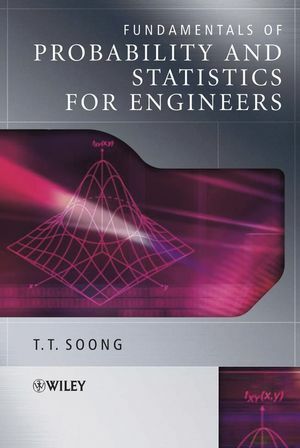 T. T. Soong is the author of Fundamentals of Probability and Statistics for Engineers, published by Wiley. Part A: Probability and Random Variables. 3. Random Variables and Probability Distributions. 5. Functions of Random Variables. 6. Some Important Discrete Distributions. 7. Some Important Continuous Distributions. Part B: Statistical Inference, Parameter Estimation, and Model Verification. 8. Observed Data and Graphical Representation. 11. Linear Models and Linear Regression. Appendix C: Answers to Selected Problems. Fundamentals of Probability and Statistics for Engineers Visit the companion website for the online solutions manual to this text. Includes an accompanying Solutions Manual for instructors containing complete step-by-step solutions to all problems.